This content contains affiliate links. As an Amazon Associate I earn from qualifying purchases. 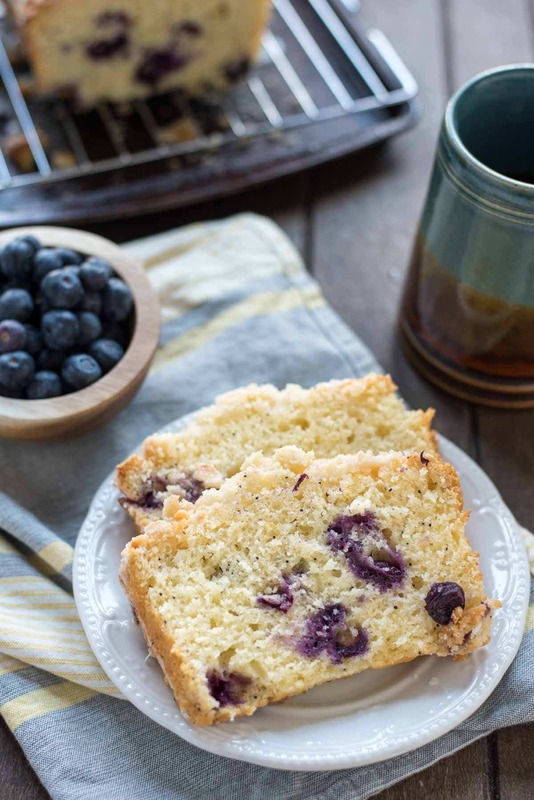 This Lemon Blueberry Crumb Bread has a buttery crisp topping and tangy lemon glaze. It belongs on all of your spring breakfast, brunch, and shower menus! Happy week-after-Easter, friends! I’m breaking out the berries and the lemon desserts, because it is spring time FOR REAL now. I ended up sick over Easter weekend, which was a major bummer. Instead of dressing up and heading to church, I spent the day perched on the couch, watching Fuller House and gazing longingly at the flood of happy family photos filling up my Facebook feed. Still, I was reminded this year that no matter my circumstances, whether sickness or health, bitter seasons or sweet, Jesus is Risen, and that is reason enough to celebrate. 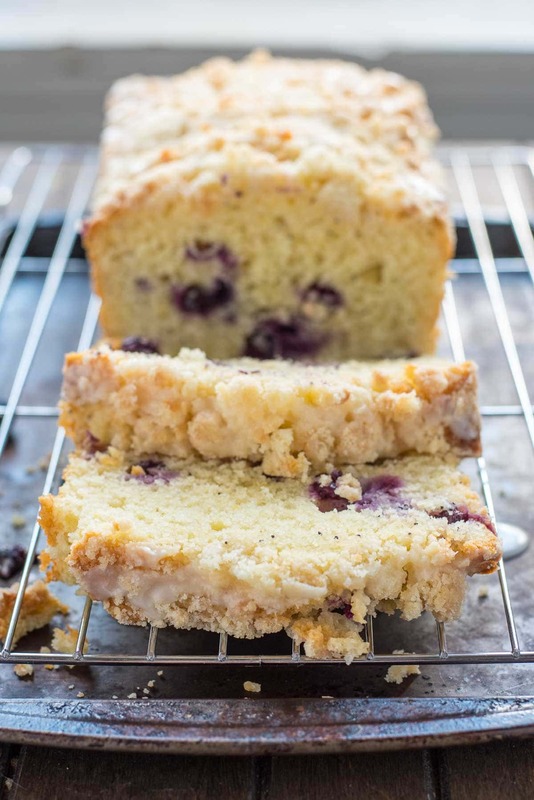 I was hoping I might be able to squeeze this recipe for Blueberry Lemon Crumb Bread in before Easter, but alas, it was not meant to be. Luckily, this bread needs no special occasion. In fact, you should probably whip some up on a Wednesday just for fun. I’ll admit, I went a little overboard on this. Originally, I wanted to make a beautiful lemon bread. Then, of course, I thought I should add poppyseeds, because obviously. But you know what else pairs well with lemon? Blueberries. So I threw a handful of those in. Then, I covered it all in a buttery crumb topping (because crunch!) and a sweet lemon glaze (because, why not?!). 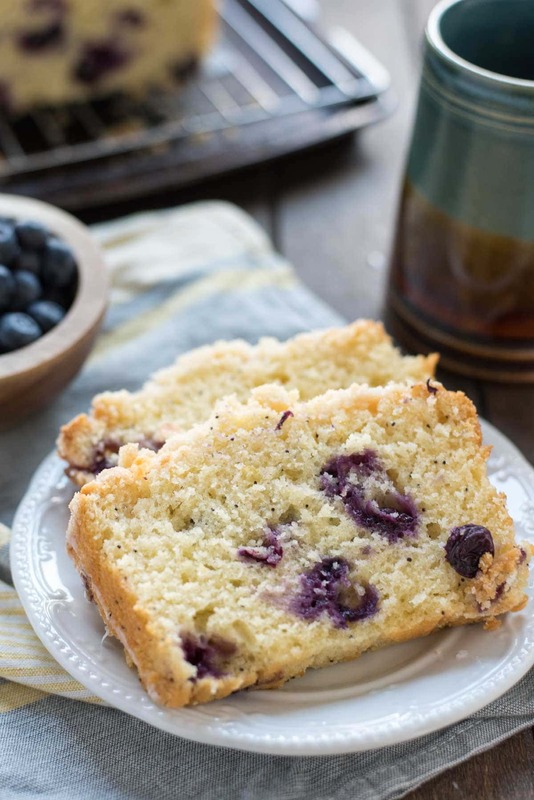 Let me tell you, if Lemon Bread is good and Lemon Poppyseed Bread is great, then this Blueberry Lemon Poppyseed Crumb Bread is awesome. The crumb topping and glaze definitely sealed the deal for me. I have dreams of starting my day in the quiet, with just this bread, a cup of coffee, and a good book, but since that probably won’t happen for a good long while, I settle instead for this bread and a cute baby in the high chair next to me. Enjoy, friends! Preheat the oven to 350 degrees. Grease a 9 x 5 inch loaf pan. In a large mixing bowl, combine the sugar, oil, lemon zest, and juice until thoroughly combined. In another bowl or large measuring cup, beat together the buttermilk and eggs. In a third bowl, whisk together the salt, baking powder, poppy seeds, and 2 1/2 cups flour. With the mixer on low speed, add the dry ingredients to the sugar mixture in three additions, alternating with the buttermilk mixture and scraping the bowl as needed. 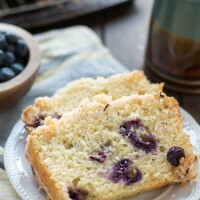 Toss the blueberries with the 2 Tablespoons of flour then gently fold them into the batter. Pour the batter into the prepared pan. To make the crumbs, combine the flour, sugar, and melted butter in a measuring cup until fine crumbs form. Spread the crumbs on top of the batter. Bake for 50-65 minutes or until a toothpick inserted in the center of the bread comes out clean. Remove the bread from the oven and place it on a rack to cool for at least 10 minutes. To release, run a knife around the edge of the bread pan and turn it over onto a piece of parchment paper. A few of the crumbs may fall off. Don't worry about it! Just scoop them up and put them back on top. Meanwhile, make the glaze--in a measuring cup, whisk together the powdered sugar, lemon juice, and milk until the consistency is smooth and pourable (add more milk if needed). Pour the glaze over the cake and serve or allow to dry then cover with saran wrap and store for up to 3 days. Hi there, friends! I’m Courtney, and I’m so happy to have you here! Feel free to take off your shoes, grab a cookie, and join the conversation. My kitchen is your kitchen. Let’s make something worth sharing! Sign up to receive new recipes and FREE members only resources straight to your inbox! Sign up for emails & get a FREE Meal Plan Ebook! for sites to earn advertising fees by advertising and linking to Amazon.com. Blog posts and recipes may contain affiliate links.